Carey Price out 6 weeks with injury; Mike Condon to play in Winter Classic? Carey Price of the Montreal Canadiens will miss a minimum of six weeks with a knee injury, the team announced on Monday. The NHL’s Winter Classic is scheduled for January 1, 2016, between the Canadiens and the Boston Bruins. Look, we’re no math majors, but it sure does sound like Carey Price will not be in the crease for the NHL’s signature outdoor event. Francois Gagnon of RDS reported on Friday that Price would miss a month, and this injury confirmation from the Canadiens estimates it’ll be mid-January before we see him again. 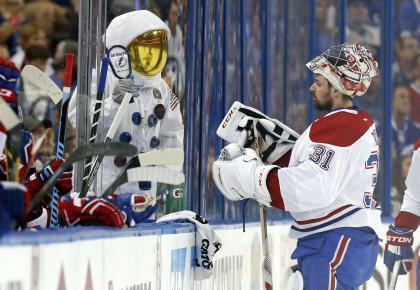 The Montreal Canadiens’ star goalie had his right knee scoped on Monday, according to the Montreal Gazette. He reinjured the knee in his third game back from an early season stint on the IR, injuring his knee in an Oct. 29 game against the Edmonton Oilers. He’s been limited to 12 games this season, going 10-2-0 with a .934 save percentage and a 2.06 GAA. Because Carey Price is quite good, in case you haven’t heard. The good news here, obviously, is that Price’s injury won’t require surgery. Well, we assume it’s good news, and the Canadiens and Price aren’t doing something stupid like trying to rehab an injury that otherwise should require surgery. But hey, it’s the NHL … you never know. So the Canadiens’ crease now belongs to Michael Condon and Dustin Tokarski. Condon filled in admirably the last time Price was injured, and has gone 8-2-3 with a 2.19 GAA and a .916 save percentage this season. But the wheels started coming off a bit for the 25-year-old netminder, has he surrendered three or more goals in five of his last six starts, going 2-2-2 in that stretch. Originally thought to be the backup for the Canadiens this season, Tokarski struggled in camp and lost his job to Condon. He has split time in the AHL with Zachary Fucale in St. John's. Due to the IceCaps schedule and his call-up to Montreal, Tokarski has not played in a game since October 28, when he allowed five goals on 28 shots against the Lehigh Valley Phantoms. The Habs have a solid cushion in the Atlantic, with a 10-point lead over the Ottawa Senators. But one imagines that plus-32 goal differential will shrink a bit without one of the best goalies on the planet tending their net for the next six weeks. As for the Winter Classic, it could be Mike Condon taking the ice for the Canadiens. The same Mike Condon who grew up in Holliston, Massachusetts.